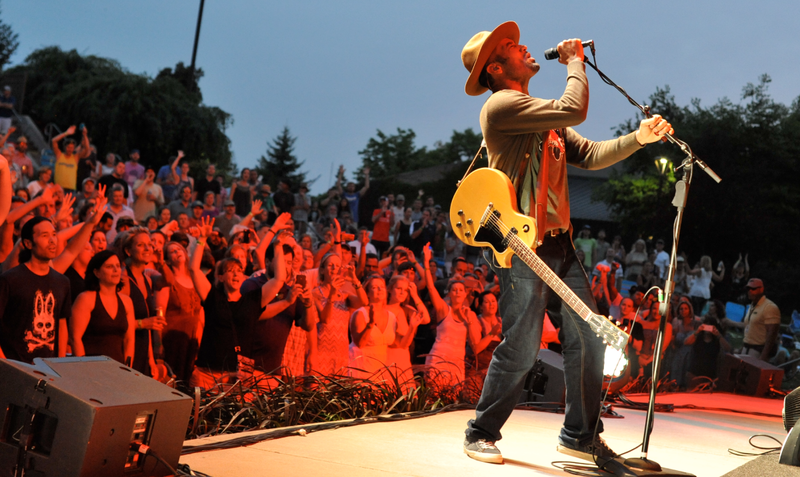 It had been seven years since Ben Harper last played a show with the Innocent Criminals, so when the time came to reunite for a live tour in 2015, the band—percussionist Leon Mobley, bassist Juan Nelson, drummer Oliver Charles, keyboardist Jason Yates, and guitarist Michael Ward—quickly discovered that Harper had more in mind than simply revisiting the group’s prodigious collection of hits. In fact, Harper had been quietly amassing material for a new record, Call It What It Is, and the first recording sessions were scheduled to begin even before the rehearsals for their triumphant four-night sold-out reunion run at the Fillmore in San Francisco. Beginning with his 1994 debut, Welcome To The Cruel World, Harper released a string of eight studio albums over a decade and a half. This extraordinary run, featuring contributions from the Innocent Criminals, established him as a singularly powerful songwriter and performer with range across multiple genres and an unmatched ability to blend the personal and political. The accolades poured in—Rolling Stone hailed his “jewels of unique and exquisitely tender rock & roll,” while Entertainment Weekly praised his “casual profundity,” and Billboard said his music “reminds us of the power and beauty of simplicity.” Massive, international sold-out tours, Top 10 debuts in the US, Gold and Platinum certifications overseas, and a slew of TV appearances cemented Harper and the band’s status as genuine global stars. It’s on the album’s bluesy title track, though, that Harper cuts to the quick. “There’s good cops and bad cops / White cops and black cops / Got to call it what it is / Murder,” he sings before invoking the names of Trayvon Martin, Ezell Ford, and Michael Brown. The new album is Harper’s second release for Stax Records. Perhaps most associated with icons like Booker T & The MGs, Otis Redding and Isaac Hayes, Stax is a seamless fit for Call It What It Is, due to its rich Civil Rights-era legacy and its dedication to spreading soul music in all its most powerful forms. Harper speaks reverently of the label, describing the honor and the privilege of calling it his home, and it’s clear the history holds a special place in his heart as both a fan and an artist. As serious and solemn as Call It What It Is can get, though, it’s also one of Harper’s most joyous records. “Shine” grooves with blissful passion, while “Pink Balloon” shows off a lyrical mischievousness that surprised even Harper himself. Like so many of the other tracks, it only fully revealed itself over time and through a free-flowing collaboration with those closest to him. The result is perhaps the proudest accomplishment of Harper’s prodigious career. For the legions of Ben Harper fans that have been waiting eight years for a new album with the Innocent Criminals, it feels even better. Join the Blues Crew - Sign Up For Our Newsletter! © 2019 Doheny Blues Festival, Inc. and Omega Events, Inc. All rights reserved. Website is a Grow Vision + Fantastic Heat Brothers Creation.